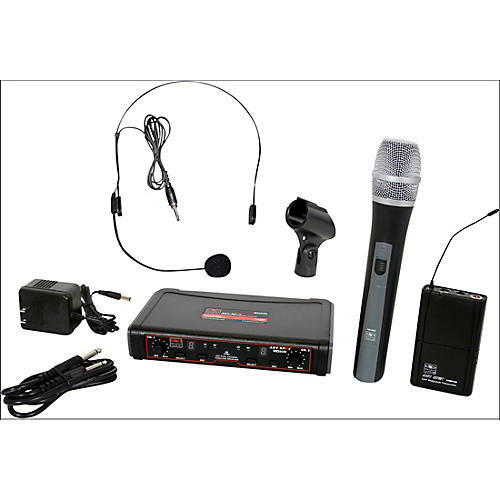 EDX Series wireless microphone system with one headset and one handheld microphone. The EDX Series dual-channel wireless systems feature two internal antennas (1 for each receiver), 16 selectable channels on each receiver, and IR Sync from receiver to transmitter, to deliver a robust wireless package at an affordable price. EDX Series wireless systems have two discreet male XLR outputs and one combined 1/4 in. output on the back of the unit. The output is easily controlled by a volume control for each receiver, located on the front of the unit. This system includes the EDXR Receiver, the HH38 Hand Held Transmitter, the MBP38 Body Back Transmitter, and the HS13-UBK Headset Microphone.